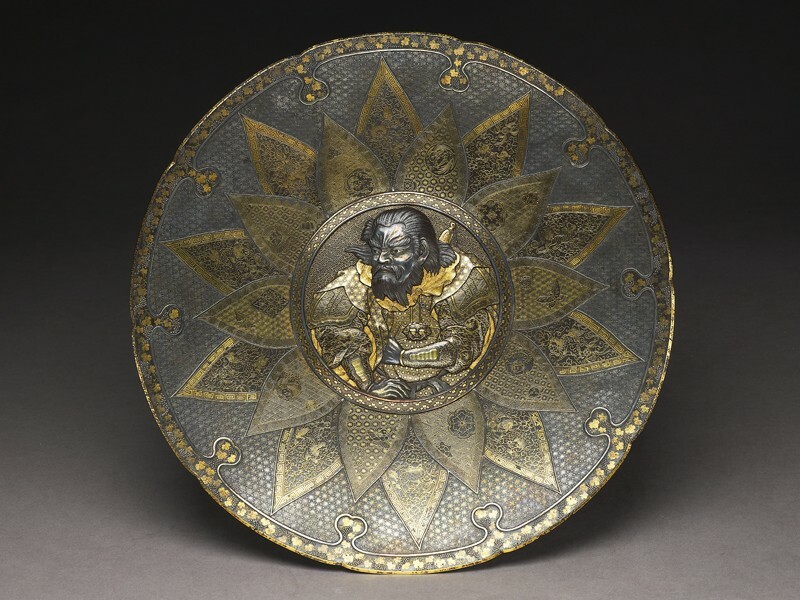 Bronze, gold and silver lobbed dish with central relief panel of a bearded Chinese warrior in shakudō, silver and gold nunome-zōgan. The body of the dish with layers of radiating petal-shapes similarly inlaid in gold nunome-zōgan in various geometric patterns and scattered cherry blossoms and butterflies, the ground with silver stars, the border with vines. Signed on the reverse: Nihon koku Kyōto jū Komai sei. The Komai Company was one of the specialist metalworking companies that descended from a sword-fitting company. Originally founded in 1841, the company did not start to make the inlaid works for which the company drew its reputation until the time of the founder’s grandson, Komai Otojirō I (1842-1917), at around the time when the wearing of swords was banned in Meiji Japan in 1876. 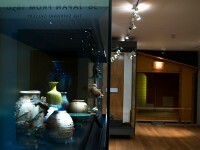 The company’s name rarely appears in Exposition catalogues because of an agreement with the important commissioning company of Ikeda Seisuke, under whose name any Komai objects would be exhibited. His shop was first in Shinmonzen and later in Furumonzen, the haunts of foreign clients in Kyōto. The company specialized in the making of bronze vases and dishes inlaid in zōgan technique in gold and silver. Dishes characteristically have a central motif with a large figure design, surrounded by pattern-making inlays, and frequently bordered by a vine pattern.